2010 – The New Year is here and this has given creative types the world over the opportunity to be, well, creative. Here are some cool 2010 images – to wish you and yours a Happy New Year 2010. The alligator story is one of many modern folktales (frequently with an ironic or horrific twist) that are retold as true, with embellishments to make them seem plausible. They appear in varying forms in different parts of the world and, like many stories, travel rapidly on the grapevine. Certain modern folktales have become classics. 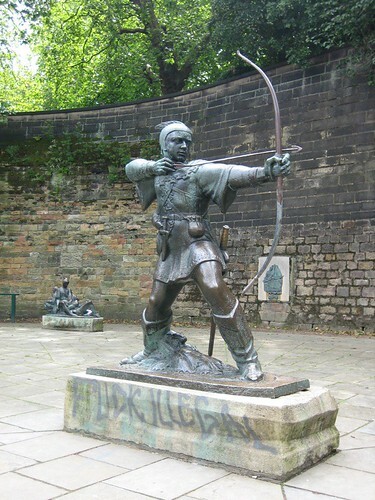 One of the most legendary and well known characters from all over the world is Robin Hood, whose exploits have been described in books, films, TV shows, even computer games. But what is the truth about this man of mystery? Russell Crowe plays the fictional movie character in an exciting manner, but the real Robin Hood is still far more exciting than any fantastical Hollywood Film. Traveling back thousands of years to unlock the mystery and the myth, Philip Gardiner takes us on an amazing journey into the heart of the timeless tale of the Hooded Man. This film was shot on location in Sherwood Forest, England - which is the very same place that Robin Hood and his band are said to have called their headquarters. Gardiner is joined by a cast of real life outlaws including the present day Robin Hood and Maid Marion. The dramatic reconstructions, amazing special effects and beautiful music, produced by James Earnshaw and his band No Redemption, turn this film into a must see for all fans of real life adventure and fantasy. In 1966 Professor Charles H. Hapgood of the University of New Hampshire published his remarkable claim that the world had been mapped before history began to be written. Navigators and geographers, he asserted, had visited and charted the New World centuries before Columbus. More controversially, he argued that the arctic mainland – not sighted until 1820, according to most historians – had actually been mapped at least 6,000 years before. Hapgood based these assertions on the study of a map drawn in 1513 by the Turkish admiral Piri Re’is. The map had some obvious errors in it: the Amazon River appeared twice, and 900 miles of South America’s east coast had been left out. But it seemed to show part of the coastline of Antarctica without any ice cover – as it would have appeared when the region was warmer, thousands of years earlier. Hapgood believed that the admiral had compiled his map from several earlier versions, some possibly dating back to Alexander the Great. The ancient Navajo language was used by young Navajo Marines to make a code during World War II that confounded the Japanese and helped win the war. Encrypted in military terms, the code developed by the Navajo Code Talkers helped the U.S. Marines to prevail at Iwo Jima and other World War II Pacific fronts. The code was never broken. According to The International Group for Historic Aircraft Recovery (TIGHAR, or as I like to say, Tighhhaaaarrr) Amelia Earhart’s final destination has recently been uncovered. They say that she made a crash landing on a small, uninhabited island in the south Pacific where she and her co-pilot, Fred Noonan, continued to live for an undetermined amount of time “Survivor” style. Poor guy. She was a brave woman, but she would definitely not be in the top 10 of women I would want to be stranded on a deserted island with. The truth is out there, maybe… Some people who disappeared without a trace..
Christmas truce memorial. Image via Wikipedia. End November, the fourth single in the Mystery Pop Series of singer-songwriter Corjan was released: The Masonic Magician Cagliostro. The Dutch singer-songwriter and "alternative history investigator" Corjan de Raaf - or simply Corjan - still writes dramatic pop songs with a head, a tail and a mystery story in between. Until recently, Corjan was probably best known for his contributions to the research into the Rennes-le-Château Mystery. But in September 2009 he started a new project: The Book of Love, a pop song inspired by Kathleen McGowan's bestselling novel with the same name. With his song, Corjan de Raaf established a crossover between his careers as a recording artist and his work as a researcher and publicist. In October followed City of Secrets (the Grail in you), a song inspired by Hollywood icon Patrice Chaplin's book City of Secrets, about the intriguing secret society in the Spanish city of Girona, formed to protect the legacy of Abbe Saunière of Rennes-le-Château. And then there was The Bond Code, based on the book of the same name by Philip Gardiner, about the secrets of Ian Fleming and James Bond. You'll find an article on the Mystery Pop Series with some really great video clips here: Mister Mystery Pop. Now, Corjan is back with a wonderful song based upon the book The Masonic Magician: The Life and Death of Count Cagliostro and His Egyptian Rite, co-written by the British authors Philippa Faulks and Robert L.D. Cooper. The 18th century adventurer Allessandro Cagliostro was a cult figure of European society in the tumultuous years leading to the French Revolution. 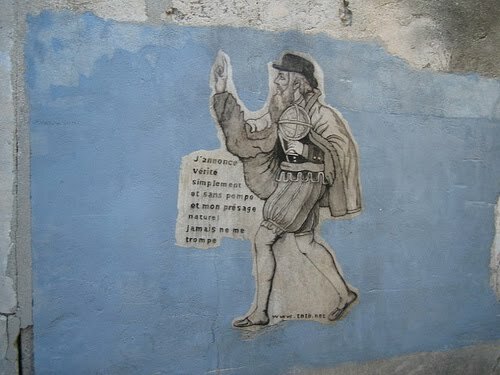 An alchemist, healer and Freemason, he inspired both wild devotion and savage ridicule as well as writers and artists such as Alexandre Dumas, Mozart and Goethe. Cagliostro, as a Freemason, introduced an Egyptian rite of immortality and thought he was immortal himself. Sadly, he was proven wrong by the Holy Inquisition and condemnedto death... The Masonic Magician tells Cagliostro’s extraordinary story, complete with the first English translation of the Egyptian Rite ever published. The authors examine the case made against him, that he was an impostor as well as a heretic and find that the Roman Church have done Count Cagliostro a terrible injustice. Corjan wrote the atmospheric uptempo mystery pop song from Cagliostro’s perspective, overthinking his life in his cold stone prison cell. He is said to have been shouting his wife’s name at night... who probably betrayed him to the Church. Cagliostro knew he would die, but hoped he had achieved immortality through the Egyptian rite. The songs is really "dramatic" and has a fascinating "mystery" story to tell; the music sounds very 80s. Click on the title for a free high quality MP3 download of Corjan's new Mystery Pop Single! There many translations and interpretations of Nostradamus' Centuries, but there are few popular editions or "Nostradamus predicted the End of the World in 2012"-articles including two extremely important textes written by him, and this for very obvious reasons. The first text is the Preface to the Centuries, dedicated to his son César, with this quote: "I have composed books of prophecies, containing each one hundred astronomic quatrains of forecasts, which I have tried to polish through obscurely, and which are perpetual vaticinations, from now to the year 3797." 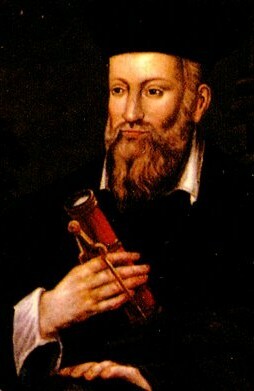 Nostradamus did not predict the End of the World in 2012. And he did not predict Obama being the Antichrist either, as is stated on numerous racist and "Christian" fundamentalist websites. This becomes very clear when you read the second extremely important prophetic text written by Nostradamus and published together with his Centuries in 1558: The Epistle to Henry II of France. This Epistle is also excluded by the Apocalypse 2012 Believers. That's why you may want to read it here in the translation (and interpretation) of the 19th century Nostradamian Charles A. Ward. Historical Mysteries however, serves you the most astonishing excerpts. Of course, Charles A. Ward interpreted the Epistle in his 19th century context, centered around the "revolutionary" date 1792 (literally in the text!). He couldn't know yet that the Epistle mentioned also another "revolutionary" date (the October Revolution) and seems to say something about our lives and times too. As is the case in the Centuries, Nostradamus deliberately seems to have messed up chronology, facts and figures... But nevertheless, there are some fascinating observations to be made. The Germans will succumb wholly and the Barbaric sect will be disquieted and driven back by the whole of the Latin race. Then shall begin the grand Empire of Antichrist in the Atila and Xerxes, [who is] to descend with innumerable multitudes, so that the coming of the Holy Spirit, issuing from the 48th degree, shall make a transmigration, chasing away the abomination of Antichrist, that made war upon the royal person of the great vicar of Jesus Christ, and against His Church, and reign per tempus, et in occasione temporis [for a time, and to the end of time]. This could be interpreted as the end of World War II, with the Germans and "the Barbaric sect" succumbed and driven back, and the rise of an Antichrist (there will be more!). But what about the "eclipse of the sun" preceding these events? Or the Grand Revolution in the month of October (Russia, 1917) which seems to happen after these events have taken place? This will be preceded by an eclipse of the sun, more obscure and tenebrose than has ever been since the creation of the world, up to the death and passion of Jesus Christ, and from thence till now. There will be in the month of October a grand revolution made, such that one would think that the librating body of the earth had lost its natural movement in the abyss of perpetual darkness. There will be seen precursive signs in the spring-time, and after extreme changes ensuing, reversal of kingdoms, and great earthquakes [i.e. wars]. All this accompanied with the procreations of the New Babylon [Paris], a miserable prostitute big with the abomination of the first holocaust [death of Louis XVI.]. It will only continue for seventy-three years seven months. Of the three sects [Lutheran, Catholic, and Mahometan], that which is in the middle, by the action of its own worshippers, will be thrown a little into decadence. The first totally throughout Europe, and the chief part of Africa exterminated by the third, by means of the poor in spirit, who by the madness engendered of libidinous luxury, will commit adultery [i.e. apostatize]. A new incursion shall be made from the maritime shores, eager to give the leap of liberty since the first taking by the Mahometans. Their assaults shall not be at all in vain, and in the place where the habitation of Abraham was, it shall be assailed by those who hold the Jovialists [followers of Jupiter (Napoleon I.?)] in reverence. The city of Achem [in the Island of Sumatra] shall be encompassed and assaulted on all sides by a great force of armed men. Their maritime forces shall be weakened by the Westerns. Upon this kingdom a great desolation shall come, and the great cities shall be depopulated, and such as enter in shall come under the vengeance of the wrath of God. The Holy Sepulchre, for so long a period an object of great veneration, shall remain exposed to the blighting dew of evening under the stars of heaven, and of the sun and moon. What great oppression shall then fall upon the princes and rulers of kingdoms, even on those who are maritime and Oriental, their tongues intermingled from all nations of the earth! Tongues of the Latin nations, mingled with Arabic and North-African communication. All the Eastern kings will be driven away, overthrown, and exterminated, not at all by means of the kings of the North and the drawing near of our age, but by means of the three secretly united who seek out death and snares by ambush sprung upon one another. Then will be the commencement [of a period] that will comprehend in itself what will long endure [i.e. the vulgar advent of the French Revolution], and in its first year there shall be a great persecution of the Christian Church, fiercer than that in Africa [by the Vandals from 1439 to 1534, and this will burst out [durera] the year one thousand seven hundred and ninety-two; they will think it to be a renovation of time. In the Adriatic there will be such permutations, that what was united will be separated, and that will be reduced to a house which before was a great city, including the Pampotan and Mesopotamia of Europe, to 45, and others to 41, 42, and 47. And in that time and those countries the infernal power will set the power of the adversaries of its law against the Church of Jesus Christ. This will constitute the second Antichrist, which will persecute that Church and its true vicar, by means of the power of the temporal kings, who in their ignorance will be reduced by tongues that will cut more than any sword in the hands of a madman. The said reign of Antichrist will only last to the death of him who was born near the [commencement] of the century, and of the other in the city of Plancus [Lyons], accompanied by him the elect of Modena, Fulcy by Ferara, upheld by the Adriatic Piedmontese, and the proximity of the great Trinacria [Sicily]. Afterwards the Gallic Ogmion shall pass the Mount Jovis [Barcelona], accompanied by so great a number that from afar the Empire shall be presented with its grand law, and then and for some time after shall be profusely shed the blood of the innocent by the guilty recently elevated to power. Then the third King of the North [Russia? ], hearing the complaint of the people from [whom he derives] his principal title, will raise up a mighty army, and pass through the limits [destroits] of his last progenitors and great-grandfathers, to him who will [qui for lui qui] replace almost everything in its old condition. The great Vicar of the Cope shall be put back to his pristine state; but, desolated and abandoned by all, will return to the sanctuary [that was]destroyed by paganism, when the Old and New Testament will be thrust out and burnt. After that Antichrist will be the infernal prince. Then at this last epoch, all the kingdoms of Christianity, as well as of the infidel world, will be shaken during the space of twenty-five years, and the wars and battles will be more grievous, and the towns, cities, castles, and all other edifices will be burnt, desolated, and destroyed with much effusion of vestal blood, married women and widows violated, sucking children dashed and broken against the walls of town; and so many evils will be committed by means of Satan, the prince infernal, that nearly all the world will become undone and desolated. Before the events occur certain strange birds [imperial eagles] will cry in the air, "To-day! to-day!" and after a given time will disappear [June, 1815]. After this has endured for a certain length of time [twenty-five years he has said before, 1790 to 1815], there will be almost renewed another reign of Saturn, the age of gold [this might be the discovery of California, but for what follows]. Private John Condon, killed in action, 14 years old. Tyne Cot Cemetery, Flanders (Belgium). Photo by Bryan A, on Flickr. 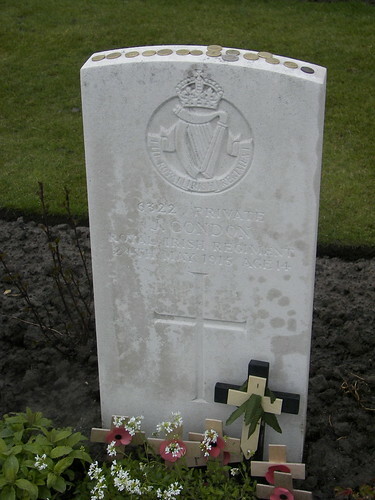 The grave of "John Condon, age 14", the youngest soldier to be killed in the Great War, is reputedly the most visited grave of the entire Western Front. According to recent investigations however, John Condon was not age 14, but age 18 when he was killed in May 1915, after only two months on the Western Front, in a German gas attack at a place called "Mouse Trap", near Ypres. The two unknown British soldiers exhumed in 1923, were misidentified as the privates Condon and Carthy. The true identity of the man buried in the grave marked "John Condon" is probably rifleman Patrick Fitzsimmons of the 2nd Royal Irish Rifles. Copyright by Patrick Bernauw / Tombstone Tales. and the Pleiades shall break forth into Weeping. and their Sound shall reach the Stars.